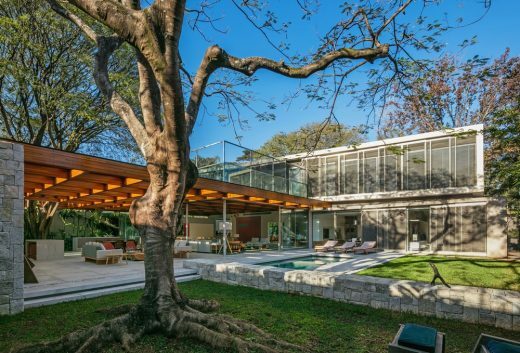 Perkins + Will was hired by a family from São Paulo, Brazil for the construction of their new residence, located at Alto de Pinheiros, a traditional neighborhood of the capital. The land, with approximately 1,000 square meters, was purchased because its natural characteristics; about 50% of it was occupied by a generous garden, including an impressive Flamboyant tree. For this reason, the respect of these conditions was the big challenge in this project. The Flamboyant became the main icon of the project, making all the solutions be designed according to the tree. Located on the eastern corner of the site, the Flamboyant was three-dimensionally digitized, thus being able to define the constructive guidelines without threaten its well-being. Once the ‘protagonist’ was defined, it should be visible to all. Starting from this principle, the living/dining room and balcony (common areas and reception) should be closely linked to it.